It was late morning when our plane landed at Shannon Airport, and close to noon by the time my friend Jineen and I were in our rental car and heading for County Tipperary. Having flown all night, with just a quick plane change at Heathrow that involved running to the gate, we were feeling somewhat bleary-eyed - but we were really excited to be visiting Ireland again. In past years we had come often on horse-buying trips, but changes in economic factors had made that less practical, so we had not been to Ireland in half a dozen years. But this time we weren�t shopping for horses - we were just on holiday. Or at least that was the official story . . .
We made our way as far as Limerick, where we stopped at the Tesco (the closest thing Ireland has to Wal-Mart) to shop for Happy Hour supplies and a cell phone. Having read online that it is a cheaper option than renting one, for about 25 euros ($32) we bought an inexpensive phone and enough minutes to last the trip - this turned out to be a very worthwhile purchase. We wanted to buy enough wine for the whole trip (the Chablis was on sale for half price! ), as well as groceries for three or four days. When we got to the checkout counter we realized that in Ireland you are expected to bring your own grocery bags when you shop, so therefore none were supplied. While we applaud this environmentally sound policy, we had not come prepared for it. I suspect that if we had been sharper there would have been an opportunity to purchase grocery bags, but somehow this chance passed us by - thus we ended up making our way across the parking lot with our arms overflowing with bread, cheese, ginger nuts and bottles of cheap Chablis. Soon we had our groceries spread out all over the tarmac as we contemplated how to pack it in the car in an organized fashion. Perhaps we could steal a box. We arrived in Cahir, passing the huge castle that sits right in the town. This grand fortress has been there for a thousand years, and the town was built up around it. We went to our friend Clare�s house, where we had tea with her and her husband Vinnie in their beautiful new glassed-in sunroom. 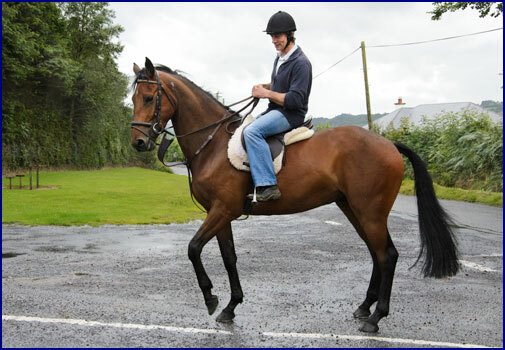 Clare is my horse agent in Ireland, and she gave me some good leads on some promising young horses. I love the Irish Sport Horses, and in past years I have often travelled to Ireland on horse-buying trips. However with the increase in prices and the rising cost of shipping horses home, over the last ten years this has become much less financially viable. But with the current economy, perhaps a bargain could be found. This trip was planned as a vacation not a horse shopping trip, but it couldn�t hurt to just take a look . . .
We stopped just north of Cashel at the Horse and Jockey, and had an excellent fish and chips dinner in the pub. Then we headed to the Derrynaflan House, our lodging for the night. This bed-and-breakfast is in a grand old house on a working farm, run by Sheila O�Sullivan. We have often stayed there in the past, and Sheila always makes us feel like family. Jet lag was catching up with us by this point, so we were asleep as soon as we hit the pillows. We woke up rested and ready to go. Sheila gave us an exceptional Irish breakfast; the bread, butter, yogurt, cheese, and fruit preserves are all made right there on the farm. With Clare�s help, we had made appointments to see some horses. First we drove southwest, down near Mallow; as we passed Buttevant Jineen and I reminisced about the time we had gone to the gypsy fair in that town. We stopped in at Evan O�Connor�s yard where we looked at several nice horses, including a four-year-old by Master Imp, one of my favorite Irish sires. Driving back toward Cashel, we stopped at the Ballybeg Abbey for a brief tour of this lovely old ruin. Then we headed up to Ballycahill, to meet up with a farmer and see his horses. The signpost system in Ireland is quite different from home, but we have visited often enough to have become quite good at finding our way around the little back roads and farm lanes. But the farmer, not trusting our ability to navigate the Irish roadways, met us at the pub and led us to his stable. He showed us a nice big rangy bay gelding that seemed to have good potential. Using our newly acquired cell phone to contact our last appointment of the day, we met up with Martin Coffey near Ballycahill and followed him to his stable. He showed us an attractive four-year-old by King�s Master, a son of Master Imp. I love this breeding, and it was obvious that Martin had done an excellent job with this promising young horse. He had been turned away on holiday for six weeks so he was quite fresh when we saw him, but Martin got on him in the stable and then hacked him up the road. We definitely felt that this young horse was of good quality. We headed back toward Cashel, and as we neared town the Rock of Cashel came into view. This amazing castle stands majestically on a hill overlooking the town. The religious stronghold was built in 1100, but the site is said to have been inhabited by Saint Patrick around the year 430. Every time I visit Cashel I am awestruck by this amazing cathedral. It is like something straight out of a fairy tale. We parked in a farm gateway where we had a great view of the castle. We watched as rain showers danced across the fields, and then the clouds parted and great shafts of sunlight illuminated the Rock of Cashel. A rainbow arched across the sky, heralding good luck for our trip. 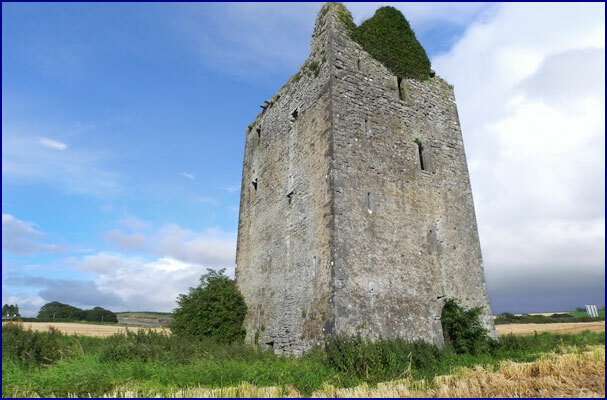 There also is another castle near Cashel, a small one, standing in a wheat field not far from the motorway. There are hundreds of these ancient towerhouses scattered around Ireland, built a millennium ago. You would think they would be protected as national monuments, but instead you see them in farmer�s fields, used as run-in sheds for livestock. Jineen and I are fascinated by these ancient relics wherever we see them, but this one, the Chalice Castle, is particularly special to us. Several decades ago a local man was metal-detecting in a bog not far from Cashel, and he discovered an eighth-century archaeological site. Among the treasures he found a fabulous silver chalice - it became known as the Derrynaflan Chalice, and is worth millions. Apparently there was a great deal of controversy over whether the chalice should belong to the finder, the landowner or the government. (While I tend to think finders keepers is a good policy, I believe the government won out in the end.) Our friend Clare knew the man who found this treasure, and we had met him once at a dinner party. But he was not the only chalice finder around! On a previous trip Jineen and I, along with my sister Patty, had done a bit of exploring and treasure hunting ourselves. After a visit to the Cahir castle and a couple of pints at the pub, we had dubbed ourselves the Knights of the Drop-leaf Table, and set out one night to explore that small castle by the motorway. We had parked by the road (the motorway was not yet built in those days) and crossed a wide field to reach the castle by the light of the moon. 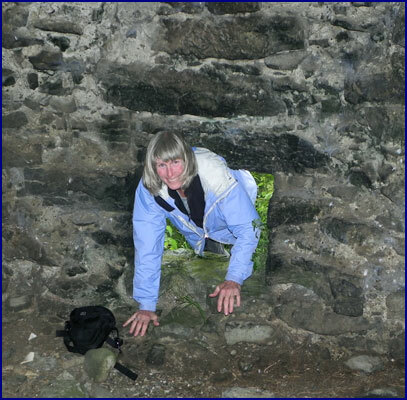 Finding the main door barred and locked, we had gone around to the back and managed to enter the castle keep by crawling through an opening at the base of the four-foot-thick wall. Once inside, we had explored by the light of our torches (Irish for flashlights). Amazingly, Jineen found a chalice. Its value and exquisite beauty may not have been as obvious as that of the Derrynaflan Chalice, and in fact some of the less informed may have mistaken it for an old galvanized feed scoop, but to our eyes it was evident that it was a priceless treasure. And in fact, when you compare our chalice to the Derrynaflan Chalice, the likeness is remarkable. The Derrynaflan Chalice (left) and our own priceless Chalice (right). So alike. So now Jineen and I were happy to return to the Chalice Castle. We parked the car in a farm gateway near the motorway, climbed the fence, and crossed the field. 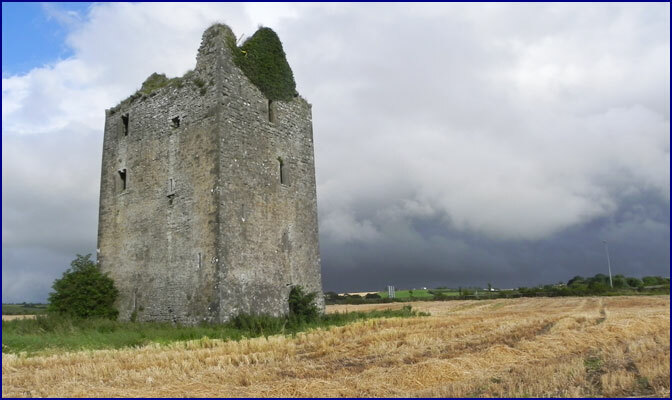 Stormy skies formed the backdrop as we approached the stone towerhouse. We knew we wouldn�t be able to go inside, having stopped by on a subsequent trip and found the opening securely blocked up, but just to walk around the outside of the ancient stronghold seemed good enough. But amazingly, inexplicably, we found that hole at the base of the thick outer wall open again, and wriggling on our bellies, we were able to once again crawl into the castle. Wishing we had brought our torches, we crossed the dark chamber, stumbling over rocks and beams on the floor. 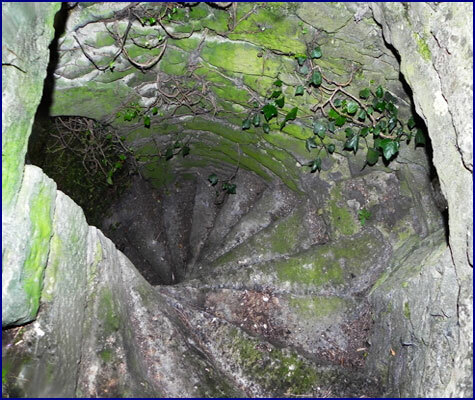 We climbed over the barricade at the bottom of the steps, and treading carefully we ascended the narrow spiral staircase. We stopped to examine each floor, looking into every nook and cranny, and peering out through the arrow-slot windows. Jineen enters the castle through the hole in the wall, and the spiral staircase in the Chalice Castle. We imagined what the castle must have been like when it was first built, nearly a thousand years ago, bustling with people and activity. Now the dank stone rooms house only a lone pair of pigeons. The roof is long gone, leaving the top story open to the air. A deep soil formed by the weight of ages covers that highest floor, and in it trees, shrubs and tall grasses grow. We peeked out over the top of the parapet, looking down over the fields and hedges. What would it have been like to stand sentinel on top of this tower in medieval times, watching for the approach of enemies across the plain? The storm clouds moved in closer as we crawled back out of the opening in the castle wall. We crossed the field and returned to our car, having a tricky time climbing back over the fence as the wire was on the inside. We returned to the Rock of Cashel and stopped by the ruins of Hore Abbey, situated near the foot of the hill. Cows grazed in the verdant pasture surrounding it, and a light rain started to fall. Jineen and I have a custom when we travel of looking for the most beautiful spot we can find at the end of the day, and sitting there with a glass of wine and some snacks to watch the sun go down. We call this Happy Hour, and as often as not we make it our dinner. 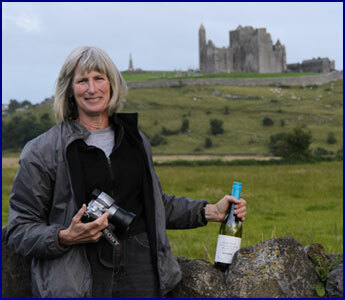 We returned to the gateway with the view of the Rock of Cashel, and as the light faded we had Happy Hour, dining on bread and cheese with pate and chutney, fortified by a bottle of white wine. It was fully dark by the time we returned to our B&B at Derrynaflan. It had been a great day, and a super start to the trip. We had another great breakfast at the Derrynaflan House, and Sheila packed us a bag lunch of homemade bread and farm cheese. We were glad to have the excellent food, but also the sack that held it; the bagless Tesco groceries were still strewn all over the back seat of the car. Our plan for the day was to drive up to Connemara on the west coast of Ireland, but we had appointments to look at a few more horses on the way. We headed north to the town of Nenagh. We stopped to visit the Nenagh castle, a round tower-house castle, totally restored, right in town. Nearby was a large kiosk on the sidewalk that was a pay toilet, emblazoned with the words �Happier Hour.� Really? Nenagh was not easy to navigate; we had a hard time finding our way into town to the castle, and an even harder time finding our way out again. We stopped by old Willie McDonald�s farm, where Jineen had found her horse Aiden years ago. Willie was busy with the farrier, but his son Bryan free-schooled a number of young horses for us. We also went by the yard of Willie�s other son, William, a show jumper. Bryan�s daughter, a little girl of about nine, was carrying around a darling striped kitten named Tiger. After a while she put him in a cage, presumably to protect him from the naughty little Jack Russell terrier that was nipping at his toes through the slats. The little girl said to her father, �If he eats Tiger, you have to buy me a new one!� We thought this was rather cold of her. We finished horse shopping, and drove northwest. 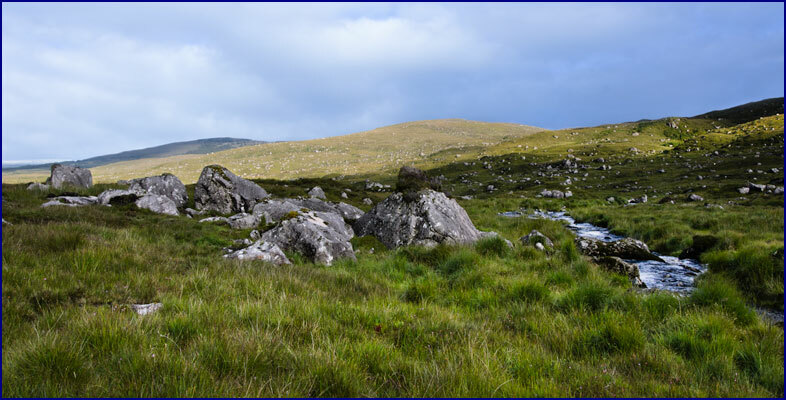 Jineen and I had been to Connemara before and had really loved it, so we were looking forward to having more time to explore this beautiful peninsula. As we entered County Galway, we started seeing its signature stone walls delineating the fields instead of hedges. We passed Galway City, and headed out onto the Connemara Peninsula. When we reached the town of Oughterard we tried to phone ahead to book a room for the night, but the tourist office was closed and we had no B&B guide, so we realized we would have to just take our chances. 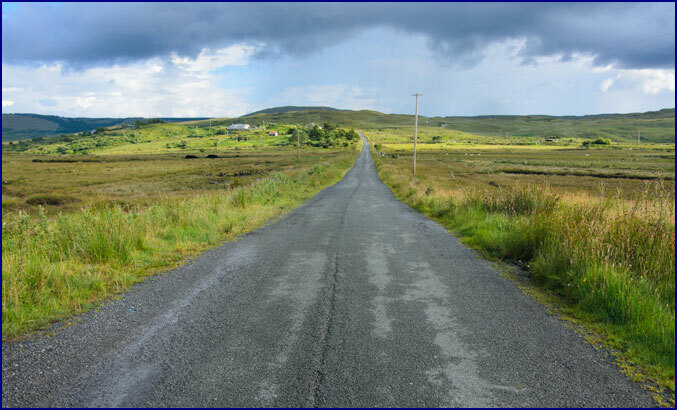 We drove back and forth through town several times before we found the little unmarked lane that would take us over the highlands and down to the southern coast of Connemara. We followed it past occasional houses and farms, and up into the hills through a dense forest of evergreens. Then the roadway came out onto the open treeless moors and narrowed even more, winding among the peat bogs and rock outcroppings. A small stream, brown from the peat, tumbled down the rocky slope, forming an impromptu waterfall. This lonely countryside seemed wild and desolate even in summer; we could only imagine what it must be like in winter. It felt like we were leaving time behind.